François Adamski comes from the north of France and he loves his region. He learned his trade at the hotel school in Le Touquet before conquering Paris, where he did his military service at the Hôtel Matignon as chef to the Prime Minister. He then went to the Plaza Athénée, the Ritz, Maison Prunier, the Intercontinental, and so on. After several years’ loyal service as Chef of the Abbaye St Ambroix in Bourges, he took a new direction in 2009, accepting the management of the magnificent "Le Gabriel", in Place de la Bourse. His faithful team followed him and, to listen to them, "it's been a real pleasure". That’s where he was awarded a star by the Guide Michelin, earned by a cooking style that combines excellence with simple authenticity, with the accent on real flavour, the kind of cooking where taste is still the keyword. 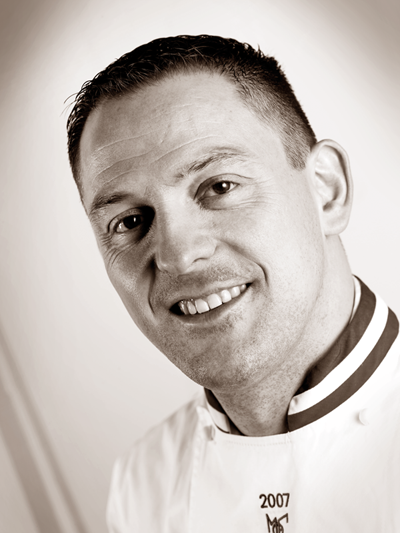 By the time he won the Bocuse d’Or in 2001, he had already cut his teeth brilliantly in a variety of national and international contests, but when he thinks back, that biggest victory of all still brings a quiver of emotion. François also earned the title of Meilleur Ouvrier de France in 2007. In 2015, he decided to go solo, working as a consultant on a variety of projects, perhaps pending a return to managing his very own kitchen some time in the future.